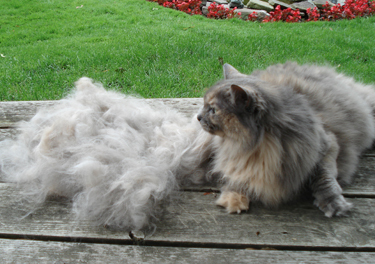 Comb your cat – green uses for cat hair! Spring is here and our furry 4 footed friends are shedding their fur, or in the case of Winston our bunny – it’s an outright molting! Compost: The nitrogen in fur and hair is wonderful for your compost bin. But since it takes a while for fur or hair to break down cut it into 1/8 inch bits, you could also toss it around your garden or let it the breeze take it to add nitrogen to your soil. Pesky Critter Repellent: Putting wads of combed out cat fur around the garden near special plants can deter snails and slugs. Wads of cat fur put down a gopher hole could scare off the critter. It can also keep squirrels, hares, chipmunks, and deer away. For these projects to do effective and safe, don’t use cat or other animal fur that was treated for fleas as the chemicals could kill or harm birds, and you would be adding poison to your compost. Film maker Morgan Spurlock spends a week at an animal shelter! Didn’t you just love Morgan Spurlock’s film Super Size Me? Currently he has a series on CNN called Inside Man. Just like in Super Size Me he physically dives into the week’s topic. In the episode which just aired called “Pets in America” he works for one week at The Animal Rescue League of Berks County in Reading, PA so he can firsthand experience everything that happens. He nurses a 3 day old kitten who was not expected to live (but did!) to cleaning kennels and witnessing euthanasia. In this short interview Morgan gets interviewed about this episode of “Inside Man” and what he learned about cat and dog over population. We tried to find a copy of the episode online for those of you who missed it, but we couldn’t find one. If CNN releases it for online viewers we’ll let you know. It will be repeated on CNN so if you have a DVR you’ll find repeats of this show. How to keep those uninvited cats out of your garden? It’s easy! We’ve been asked literally thousands of times for ways to humanely keep the neighbor’s cats or ferals out of flower and vegetable beds. And as you know from reading our website the number one trigger for cats peeing outside the box is the presence of cats in your yard. We tried all kinds of battery operated gizmos to keep cats out of our rose garden and vegetable beds including the ones which shoot water when the cat comes within range. Some worked pretty well, and others failed. Some worked for awhile then they malfunctioned. We would never use toxic “pet repellents” And we certainly wouldn’t use cayenne pepper because if it gets into the cat’s eyes they could gauge their eyes out trying to rub at the burning pain. A very astute Biodynamic gardener told us about something which has worked beautifully for us. We are avid organic gardeners and obviously we are devoted to cats, but frankly we were getting fed up with finding cat poop among the lettuces. Her suggestion sounded good, so we tried it. 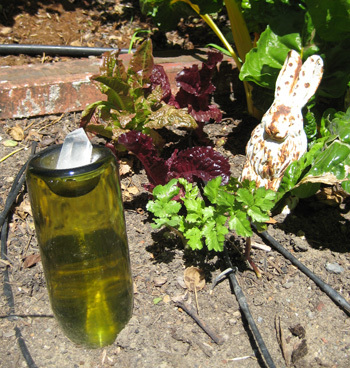 It’s an old country Italian trick where you fill glass bottles with water then place them around your garden. Why does it work? The water filled bottles shimmer in the sunlight. This shimmer is something which does not exist in nature and the cat doesn’t understand it or like it, so the cat leaves right away. We experimented with several different bottles until we decided that the pale green color of white wine bottles give the most shimmer in sunlight. Soak off the label. Fill the bottle with water and replace the cap. We think turning them upside down with the neck in the dirt looks sort of arty and whimsical! For added shimmer and cosmic fun we’ve put a big crystal in the dimple of the bottom of some of the bottles. We know that this remedy may sound crazy, but really, it works. It’s been 5 years now and we’ve not found a single "feline calling card" in with the roses or the vegetables. Other than the wine, it’s practically a free solution! This is the most economical, humane, and non toxic feline garden abatement we know of. Shortly after we posted this tip we heard from a long time friend of Cat Faeries who is an Italian countess. She wrote to tell us that you see water filled wine bottles in gardens all over Italy. Many are near or under key plants. If the plants are particularly precious you might see several bottles grouped together. Thank you Contessa dearest for adding this for us! You may never see other cats in your garden. The feral cats and some neighbor’s cats come around at nighttime when we are asleep. One telltale sign is if Kitty sprays at night. Bingo! You’ve definitely got outside cats coming at night and they are probably spraying on or around your front door or other doors, even under the windows as well as everything in the garden. It took a long time to find American made 4 oz. bottles and when we found them we offered them again for Multi Cat Household, Territorial Rescue, Calm and Serene, and Love My Litter Box. We got requests for 4 oz. bottles of Kidney Kitty and Elder Support, and because we want you to be happy – we’ve got them for you! FREE Shipping when your order contains only flower essences! We hope you love this as much as we do! Your cats will love you. You’ll love our Cat Faeries Flower Essences for Cats and Flower Drop Faeries single essences for your own formulas for friends and family. Hello Spring!